JOHANNESBURG (AFP) - Nelson Mandela ducked out of an arranged marriage when he was a student, then went on to wed three times. His first two marriages collapsed under the strain of politics, but the third time around he found enduring happiness with the widow of Mozambican president Samora Machel. In sharp contrast to Graca Machel and his feisty second wife Winnie, Mandela's first wife was a demure country girl who kept well away from politics. Like him, Evelyn Wase hailed from the rural Transkei and had come to Johannesburg in the early 1940s to carve out a living in the big city. She was the cousin of African National Congress (ANC) stalwart Walter Sisulu and met Mandela in Sisulu's home in Soweto, southwest of Johannesburg, in 1944. They married months later, in the same year that Mandela, Sisulu and Oliver Tambo formed the ANC's Youth League and politics of struggle against white minority rule came to consume Mandela's life. Descriptions of their first years tell of Evelyn as the happy housewife with Mandela bathing their three babies and helping with the cooking when his work at his law practice and political meetings were done. But by 1954, Evelyn had buried herself in religion, like her husband had in politics, and resented his absences. When Mandela was arrested for treason the first time, he came home on bail to find Evelyn had gone, leaving behind their two youngest children. She returned to the Transkei, ran a shop and remarried in her 70s. 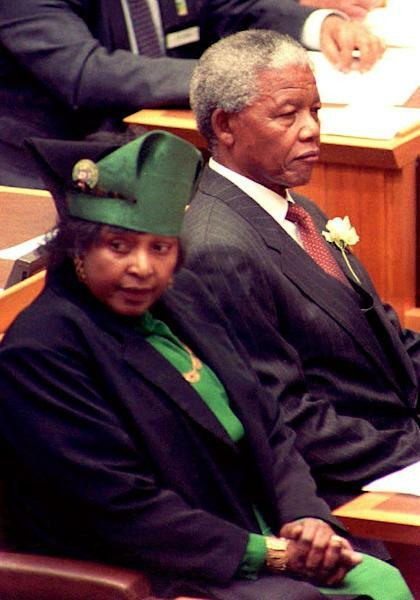 Winnie -- who died aged 81 on Monday -- came into Mandela's life at the start of a second treason trial, which would see him jailed for 27 years, and they married in June 1958. She too came from the country, but took to the city, and once she met Mandela, also dove into politics. Soon after their wedding, she was arrested for an incendiary speech, leading Mandela to remark -- proudly and prophetically -- "I think I married trouble". The couple had two daughters before the prison doors slammed behind Mandela in 1964. In the coming years, Winnie would be in and out of jail as the police hounded her in a bid to demoralise him. In 1969, she was held in solitary confinement for 13 months on terrorism charges and in 1973 endured another six months in jail, but when the 1976 student riot revolt broke out in Soweto, Winnie was unbowed, urging crowds to "fight to the bitter end". The police saw her as a mastermind of the uprising. She was locked up for five months, then banished to the desolate town of Brandfort for seven years. When she returned to Soweto, the firebrand militant-martyr became a liability for Mandela and the anti-apartheid movement. In 1986, at a time when suspected traitors were being burned alive in the volatile townships, Winnie declared that South African blacks would be freed "with our matchboxes". She surrounded herself with a band of thugs christened the Mandela United Football Club who murdered a young activist called Stompie Sepei. Her bond with Mandela had endured through letters and visits to prison and when he was released in 1990 Winnie was there holding his hand, but in private she had a young lover. 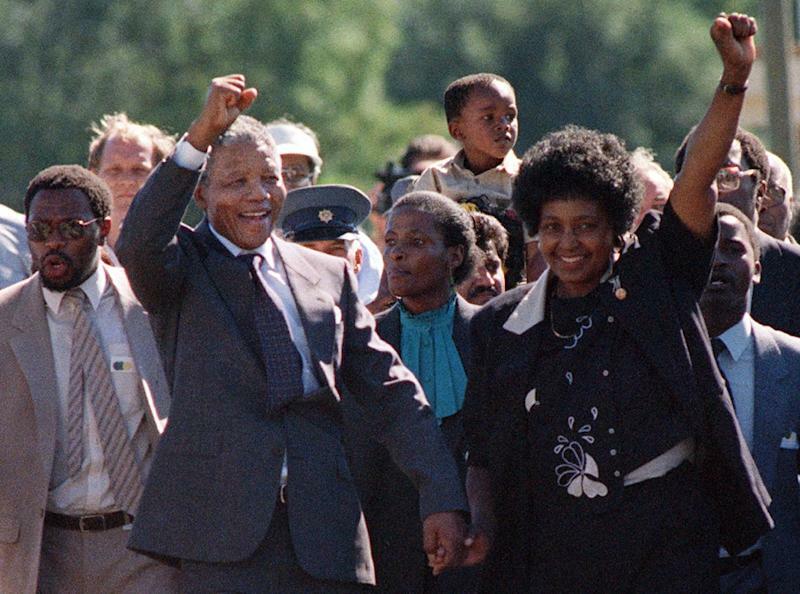 Mandela stood by her when she was convicted for kidnapping Sepei and only in 1992 announced their separation. 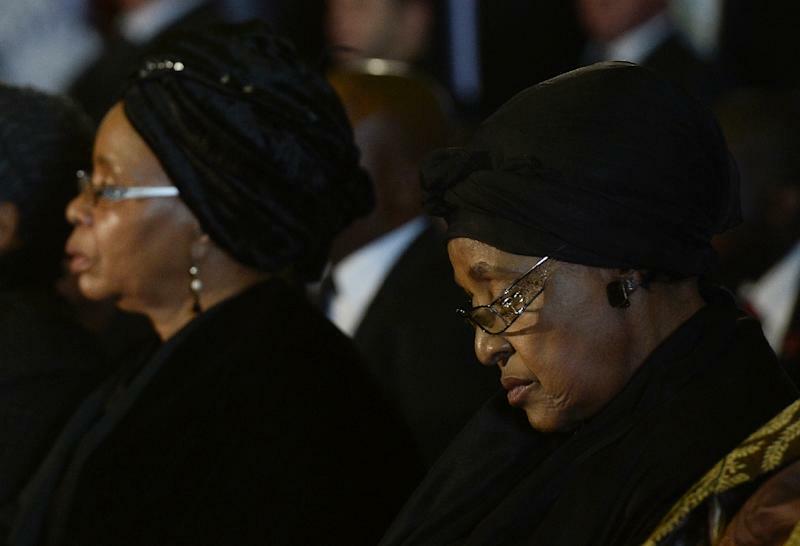 Winnie's six-year sentence was suspended on appeal and in 1994 she was appointed a deputy minister in his government, but was later sacked for insubordination. By the mid-90s, Mandela was courting Graca Machel -- a woman 27 years younger than him who studied in Lisbon before she became a freedom fighter for Samora Machel's Frelimo movement, and eventually Machel's education minister and wife. Graca's first contact with Mandela came in 1986 when her husband died in an air crash that many believe was orchestrated by the apartheid regime, and he wrote to her from prison. When they met in Mozambique in 1990, Machel was still in mourning. But two years later Mandela became the godfather of her stepchildren and in 1996 they were spotted at President Robert Mugabe's wedding. Mandela was smitten and let the press in on their love story, telling reporters: "Late in life, I am blooming like a flower because of the love and support she has given me." On July 18, 1998 -- Mandela's 80th birthday -- Machel broke her vow that she would not marry another president. While clearly a proud husband, Mandela joked that sometimes he found it hard to keep pace with the younger woman. "She is busier than I am. We meet for lunch, go off and then only see each other again for supper. I wish I had married a wife who was less busy," he told students in 2007.